← How to register PDF Stamper Command Line software (pdfstamp.exe) and remove demo watermark from stamped PDF files? Printing HTML to PDF with CSS. Typeset quality PDF. Web Standard Compliant. 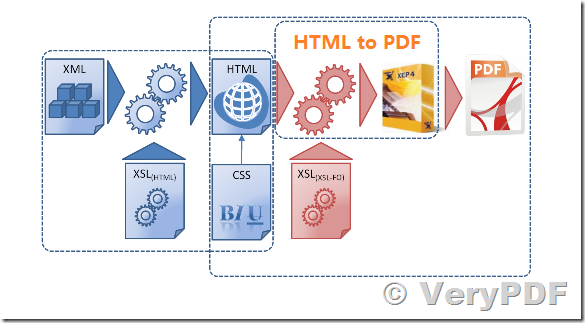 Best XML to PDF Conversion solution! VeryPDF HTML to PDF Converter is the perfect printing component for web applications. It is typically used for server-side conversion of HTML to PDF, ranging from dynamic data-driven documents (reports, invoices, forms, data sheets) for electronic distribution to complex and high-quality PDFs (catalogs, marketing collateral, technical documentation, journals) for print and electronic publishing. 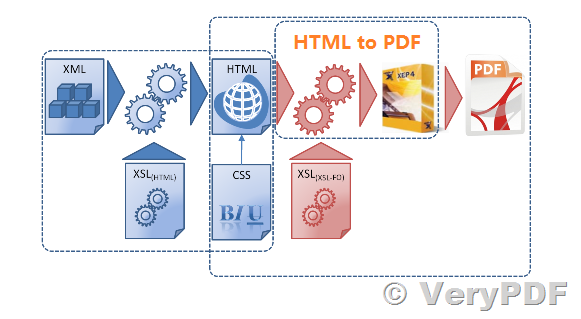 HTML 5: Convert your HTML5 to PDF documents without additional pre-processing or clean-up. Supports all HTML5 elements. CSS3: Use cutting-edge CSS3 to create great looking tables and text. Apply gradients to elements, transform, rotate, scale them. Supports regions and running elements. Accessibility: VeryPDF HTML to PDF Converter supports the creation of tagged PDF documents in line with accessibility guidelines. PDF/A: VeryPDF HTML to PDF Converter easily allows to create PDF/A (1a, 3a) compliant files for the long-term archiving of electronic documents. W3C Standards: VeryPDF HTML to PDF Converter is based on the latest W3C standards for CSS 2.1, CSS 3, HTML and XML, providing the highest flexibility and interoperability. Smart Pagination: Documents are automatically paginated. Page breaks do not slice through images or lines of text. Optionally control page breaks via CSS. Automatic Font Fall-Back: Automatic fall-back to one or more specified fonts if a glyph can not be found in the font used in the document. Layout: Support for multi-column layouts, automatic hyphenation, page numbers, headers and footers, footnotes, floats, positioning, margins, padding, tables. Table of Contents: Intuitively generate an automatic table of contents, including page numbers, leaders and links to the chapters. Generated Content: Use generated content to display cross references, page numbers, the title of the target chapter, numbered headings and more dynamically. Shrink-to-fit: Automatically or manually adjust the DPI value for pixels to ensure elements with fixed width (such as images or tables) do not exceed the page. Web Fonts: Enhance your documents with beautiful fonts without having to install any fonts on the server or the user’s system. Integration: Integrate VeryPDF HTML to PDF Converter into the environment of your choice using the Java, PHP, .NET, Python, Ruby and Perl API. Input: Enhance your documents SVG images, MathML formulas, barcodes and QR codes. Embed multimedia objects such as videos and Flash. Merging & Overlaying: Merge documents with existing PDFs by appending or overlaying them. Place multiple pages on one sheet and rearrange the order of pages. Internationalization: Supports both RTL and LTR text, automatic Arabic shaping and a wide range of languages such as Chinese, Japanese, Korean, Arabic, Hebrew, Hindi and others. Printer Marks: Add printer marks incl. trim marks, bleed marks, registration marks, color bars. Allow the content to bleed off the trim area through PDF page boxes. Hyperlinks & Bookmarks: Add hyperlinks from your source document, bookmarks for your headings, and PDF metadata such as author, title, subject and keywords. Styled Interactive PDF Forms: Produce complex interactive forms from HTML documents. Interactive form elements can be fully styled via CSS. CMYK Color Space: VeryPDF HTML to PDF Converter can produce PDF documents in the CMYK color space. All color keywords can be translated into both RGB and CMYK. Digital Signature: Digitally sign your PDFs with a X.509 certificate and ensure that the document has not been tampered with after its creation. Encryption & Restrictions: Encrypt and secure PDF documents created with VeryPDF HTML to PDF Converter with owner and user passwords. This also enables you to enforce various restrictions. Viewer Preferences: Control your PDF viewer’s appearance by setting viewer preferences in the PDF. Hide parts of the viewer’s UI, adapt the page layout. Sessions, Headers & Cookies: Set arbitrary HTTP headers for all connections established by VeryPDF HTML to PDF Converter, or set cookies. This enables you pass a session ID to VeryPDF HTML to PDF Converter. HTTP Authentication: Convert documents that require a password for their HTTP connections. The Basic and Digest authentication schemes are supported. Exceeding Contents Detection: Log a warning if an element exceeds a page or the border of page content. Information about those elements can be retrieved programmatically. Raster Image Output: Create raster images (JPEG, PNG, GIF, TIFF) from your HTML documents. Generate thumbnails, previews and high-fidelity graphics from your documents. Scalability: Natively supports 64bit on all operating systems incl. Windows Server, allowing you to allocate more memory for processing very large and complex documents. How to set the bit depth while converting html to tga? How to rotate pages when convert HTML to TIF? How to save website to multipage tiff file? This entry was posted in HTML Converter (htmltools), VeryPDF SDK & COM and tagged HTML to PDF. Bookmark the permalink.